You work hard in the sixth house, but Uranus allows you to get creative with your workload. You thrive on finding new and interesting ways to handle mundane tasks. Because you are so detail-oriented you’re able to come up with ideas that keep you engaged and excited about your routine. In astrology, planet Uranus is a symbol of radical thinking, individuality and originality. With Uranus in the sixth house you definitely have your own way of doing things. Even though you are serious in your craft and in your home life, you also know the best way to take care of any situation. 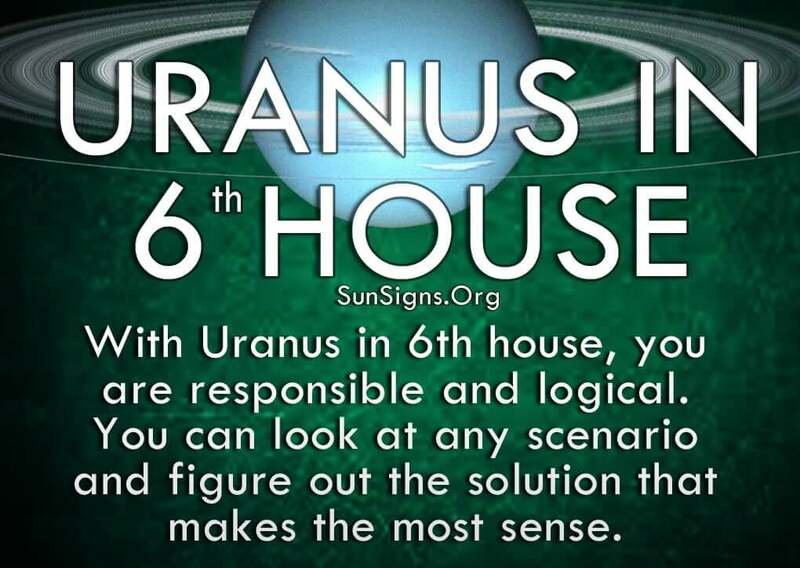 With Uranus in the 6th house, you are responsible and logical. You can look at any scenario and figure out the solution that makes the most sense. And you love adding unique finishing touches on anything you do, making whatever you do your own. Whether it’s working on a project for your job or setting up an event for friends or family, you execute your plan flawlessly and put in little details that no one else would have thought of. And people appreciate your sense of style and the care that you put into everything you do. But your perfectionist tendencies can get the better of you if you’re not careful. While you have these high standards, there are others who don’t. People with Uranus in 6th house in their horoscope, enjoy their freedom as much as anyone else. So don’t push your ideas or ways of doing things on other people. While you feel you know best, there are others who also have great ideas. Let them join in the conversation and help you create a plan that works for everyone involved. That way you can take some of the pressure from yourself and help other people to feel useful and appreciated. The main problem Uranus in 6th house have is placing high standards on everyone else around them. Then when these standards aren’t met you become overly critical of someone else’s work. Don’t push your perfectionist desires on other people. Even those closest to you don’t want to have to deal with that. You’ll have to get used to being one of the few people who pays that much attention to the minute details, because it can become quite exhausting after a while. Sometimes people just want to relax and have fun, and you have to tap into your creative Uranus energy to come up with something spontaneous but not taxing. Learn to let loose and live a little. The one thing Uranus in 6th house doesn’t want you to do is have a boring desk job that keeps you stranded in an office all day. Volunteer work is perfect for you, as is working in the field of technology or science. Here you can put your attention to detail to great use and come up with interesting solutions at the same time. Just like you want recognition for your hard work and good deeds, so do the other people who help you. If you learn to work within a team you’ll have a much easier time pulling off your intricate plans and it won’t be so stressful. You have to let go of your perfectionist ways sometimes to really enjoy what’s going on around you. You sometimes have trouble seeing the forest through the trees, and that can be more of a problem than you realize. Don’t miss out on the wonderful details of life!